Public proxies die fast. It’s usually because too many people are using them. If you need stable proxies, you can buy private proxies which are only open to paid users. Usually a working proxy won’t live for long. It’s because too many people are using it. When you use a proxy, you are using the resource on the proxy server such as its CPU, memory and bandwidth which are all limited. Most working proxies on the Internet are public proxy which are open to everyone. Because of the lack of access control, the working proxy will die if the number of users exceeds the capability of the server. If a working proxy can be found easily on the Internet, it usually lives very shortly. Thus a working proxy usually can live for only several hours. You should check whether the proxies are still working before using them. Our software Elite Proxy Switcher can help you to check the availability of proxies as well as the speed and anonymity. Some dead proxies may become working again. It’s because its users change to other proxies and its load become normal again. If you don’t want to test the proxies, you can just buy checked proxy list from us. Our premium proxy list is updated every minute. It ensures that every proxy in the list is working and anonymous. It’s for the users who want to get working proxies quickly without testing a big list. Windows XP users may have problem checking proxies. The premium list is best for them. If you need a working proxy living for a long time, you need to buy a private proxy. 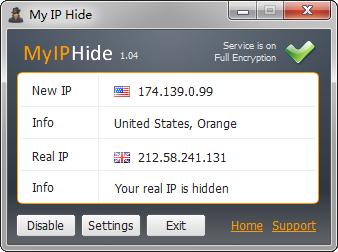 Our software My IP Hide is an encrypted private proxy service which can unblock websites as well as change your IP. The private proxy service is available 24/7. It’s hosted on our dedicated servers. We monitor the status of them every minute. It ensures that our users can always use our service whenever they need. Next Next post: How to Block Proxy?